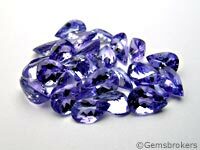 Tanzanite which is more blue rather than purple is more expensive. Tanzanite is very attractive if well cut so special attention should be given to the overall proportions. Due to the perfect cleavage of this stone, handle it with great care. The color of tanzanite is most intense in sizes above ten carats. Smaller tanzanites are usually pale in color.